iBank 3, the personal finance manager announced by IGG Software Wednesday, taps into a pair of popular Apple products for many of its new features. In addition to adding features built around Apple's recent OS X 10.5 update, iBank 3 also will include iBank for iPhone, a Web-based application that allows users to enter transactions via Apple's smartphone. Leopard-based features in iBank 3 include an enhanced view that allows users to flip through transactions à la Cover Flow. 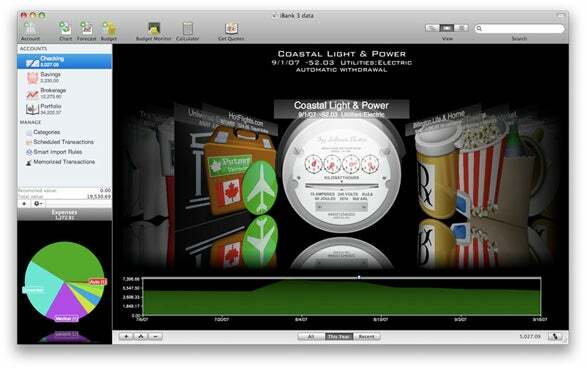 The finance app also draws on Leopard's Core Animation technology to help interactive graphs come together as a user creates transactions. Like other financial applications including Quicken and TurboTax, iBank 3 users can now directly download transactions from a variety of banks using the OFX file format. Other built-in features include the ability to take pictures of receipts and other financial items, assigning them to transactions to help visualize spending. A new smart portfolio engine helps track finances while a loan management module can help track loan activity. iBank 3 will require OS X 10.5 when it ships later this quarter. IGG says a public beta will be available soon. iBank for iPhone will also be available in the first quarter; it requires a .Mac account.